Xander: So, with Buffy and Riley having... you know, acts of nakedness around the clock lately, maybe they set something free... like a big, bursting poltergasm. We did the 'haunted fraternity' thing in the Halloween episode, but it's back in a sexier form for "WHERE THE WILD THINGS ARE"; an episode that also lifted the odd idea from Angel's "Rm w/a Vu". After four seasons and with a spin-off now also devouring story ideas, my guess is more instalments will begin to feel very samey from this point onwards, but I'm hopefully wrong. Tracey Forbes was behind the god-awful "Beer Bad", then redeemed herself with the enjoyable "Something Blue", but departs Buffy the Vampire Slayer on a downer with the ill-conceived "Where the Wild Things Are" (even the title's a head-scratcher, unless it was meant to loosely explain why the haunted house became overgrown with creepers near the end). In this episode, it's made very clear that Buffy (Sarah Michelle Gellar) and Riley (Marc Blucas) are at it likes rabbits—which is understandable, given they're both fine specimens of their respective genders. I sometimes wonder how they find time to fight the forces of darkness. Of course, BtVS is the kind of show that doesn't bludgeon you over the head about something without it having great significance later. And lo, the 'Buffly'* sexual energy is powering poltergeist activity from a group of ghostly children who were traumatised and abused by a Christian fundamentalist (who was incredibly forthcoming about her role in matters under such light interrogation). It was a pretty dumb idea, which is probably why half the episode kept all that nonsense under wraps. And for awhile it worked, as it was hard to imagine what a party-goer cutting her hair off, Buffy shagging Riley, and orgasmic wallpaper had in common. There were some fun moments dotted about; including a welcome interaction between Spike (James Marsters) and Anya (Emma Caulfield)--as someone realised the parallels of those characters as previously fearsome demons who've since lost their mojo. The moment the gang raced to get help from Giles (Anthony Head), only to discover him singing and playing guitar (very well), was also a fun reveal. It was also unusual to have an episode where Buffy was marginalised and became an unwitting damsel-in-distress, which gave the episode a different energy. Sadly, none of that really excuses the mystery being solved in a rushed and unsatisfying manner, and the mystery itself being epically stupid. * I'm guessing nobody used the portmanteau 'Buffly' in 2000, as it was a pre-Bennifer (Ben Affleck/Jennifer Lopez) world. 'Brangelina' wasn't even a thing. Crazy times. Angel (on Faith): Giles said she left Sunnydale about a week ago. He described her mental state as 'borderline psychotic'. Cordelia: That explains her outfit. A fan-pleasing crossover with BtVS occurs once again with Angel's "FIVE BY FIVE", but in a manner I wasn't expecting. Rebellious Slayer Faith (Eliza Dushku) awoke from her coma and terrorised Sunnydale in the recent "This Year's Girl"/"Who Are You" two-parter, and now she's back to do exactly the same in Los Angeles. More specifically, having found herself in the big city, Faith is soon hired by legal firm Wolfram & Hart to assassinate the meddlesome Angel (David Boreanaz)--who recently foiled one of their cases by helping the prosecution deliver a key witness to trial. It's a mission Faith would likely undertake pro bono, as there's still bad blood between the 'Other Slayer' and the 'Vampire With A Soul'. Thrown into the mix were some flashbacks to the moment Angel regained his soul in Romania, having been cursed by gypsies and consequently shunned by his companion/maker Darla (Julie Benz); a sub-plot existing to underline how Angel has first-hand knowledge of both the allure of evil, and the enrichment of being good. "Five by Five" is certainly amongst the best episodes Angel has produced thus far, even if the core storyline was a little pedestrian. I thought Wolfram & Hart were going to factor into the story a lot more, but this episode merely confirmed they're a bigger concern moving forward. Associating lawyers with evil is far from clever or insightful, but I'm intrigued by exactly what W&H are about. What do they want exactly? They clearly have links to the occult and an awareness of things like vampires, demons, and Slayers, but there must be more to it. Or so one hopes. For now, they're just a small group of white collar troublemakers dressed like L.A Law extras—particularly Thomas Burr (Lee Mercer). Of greater appeal was simply watching Faith cut loose, as Dushku's a lot of fun playing a delinquent who packs an unexpected physical punch. I especially liked the scene where she caused a mass brawl in a nightclub and merrily danced amidst the ensuing mayhem. A later scene where she kidnapped and tortured Wesley (Alexis Denisoff) was also good, and felt like it had a tone mother series BtVS would struggle to get away with. Plus there was a magnificent climax where Faith and Angel had a huge battle, which for once delivered on the idea of two "super humans" tearing chunks off each other. Even better was how Angel managed to get through to Faith's shrivelled heart, by making her realise she's just self-destructive and ashamed of herself. Her violence nothing more than a cry for help; a plea to be put out of her misery--which Angel managed with an embrace from a similarly troubled soul, not the desired death blow. Overall, it's beginning to feel like Faith's the antidote to a struggling season at both ends the Buffy/Angel spectrum. 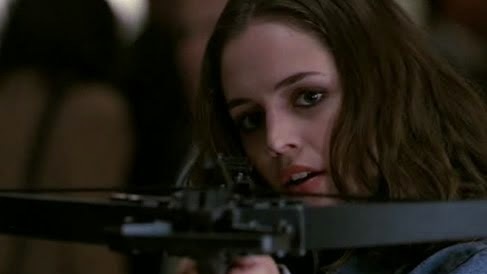 I've always found her more interesting compared to either Angel or Buffy, so her appearances have always been highlights for me. Dushku's not the greatest actress in the world (as Dollhouse later confirmed unequivocally), but she's great at insolence and sauciness, looks great in leather, and appears more capable in the action stakes than the rest of the cast. Or the show's getting better at disguising its stunt doubles.